Only products’s DID been activated then allowed to use Bluetooth logo. Developer’s who built the products based on Raytac module is allow to relable Raytac’s DID to easy the process. Simply purchase their own DID from SIG, and relabel Raytac’s DID then can completethe Bluetooth activation process. Raytac’s MDBT40/MDBT40-P QDID/DID is applied by subsidiary of Ginstar Corporation. 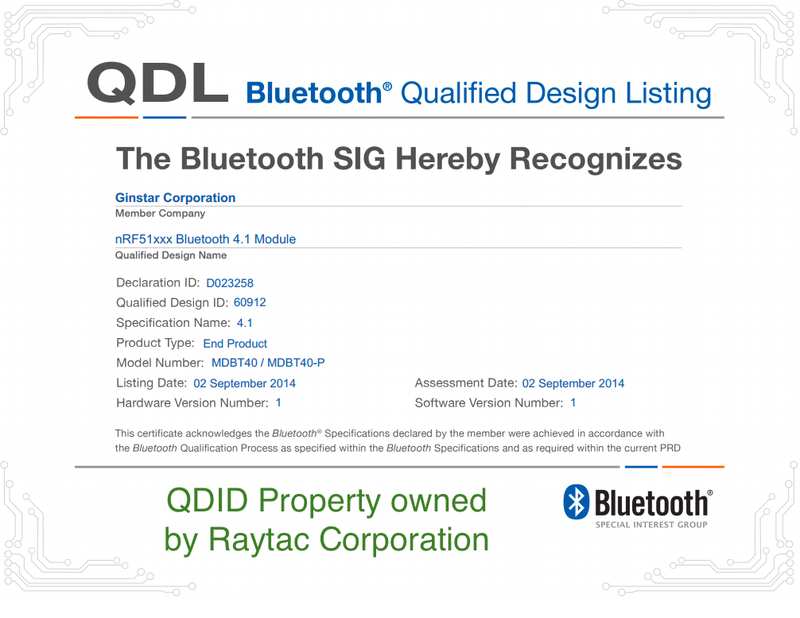 We welcome all Raytac’s customers to relabel the QDID as long as product built by MDBT40/MDBT40-P. As such, the Bluetooth process becomes simple and cost effective.